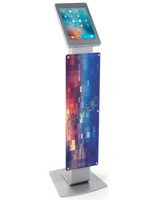 Want to create exciting displays and promotional tools for almost any setting? 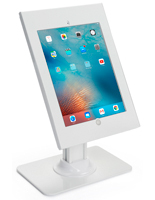 These iPad Pro kiosks can feature the newest touchscreen for a number of uses. Easily create a POS fixture for customer or employee use by placing on a store counter. 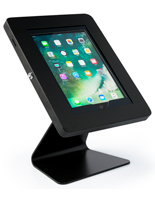 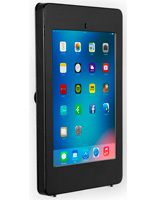 iPad Pro kiosks, or Apple® tablet holders, can act as cash registers or give more information to patrons with the right app. Alternatively, the floor or countertop standing enclosures can be brought to trade shows where they can feature a tailored presentation for passersby. 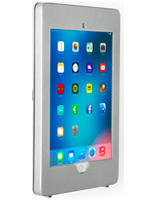 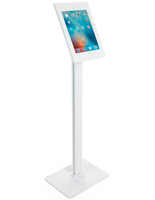 The iPad Pro kiosks create an interesting experience using dynamic media that is sure to keep onlookers' attention. 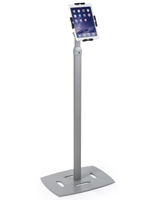 Our selection of mounts is offered in a number of constructions to assist any business with promotion and productivity. 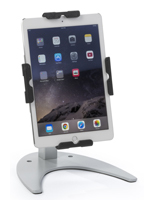 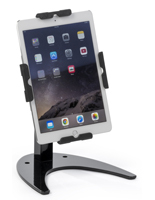 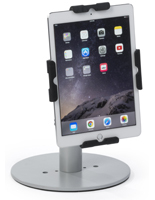 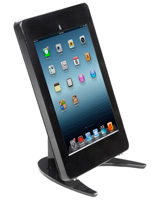 What options are available with these Apple® tablet holders? 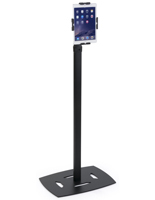 iPad Pro kiosks are available in three different placement options: floor standing, countertop sitting and wall mounted. 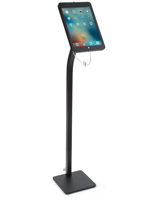 As previously mentioned, stores can make great use out of counter units to handle POS transactions and merchandise information. However, not everyone has enough countertop space for new fixtures. 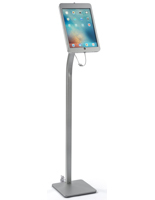 Our wall mounts and floor standing models can make up for this by featuring interactive devices where they can fit. 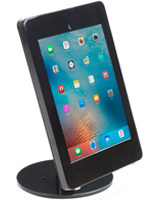 In addition, some countertop units come with mounting holes for extra security. 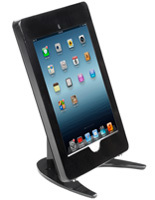 These Apple® tablet holders come in one of two neutral shades to match any environment. 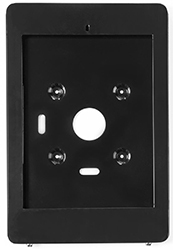 With sleek silver and modern black to choose from, anyone can find an enclosure that fits their color scheme. 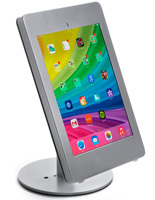 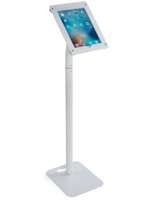 Most of our iPad kiosks feature a rotating and tilting bracket to accommodate different heights and change orientations. 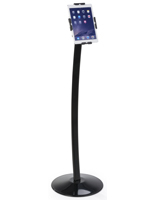 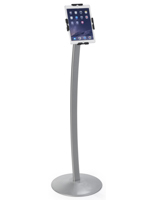 Stands and wall mounts can move for the best possible view or change position for both employee and customer use. 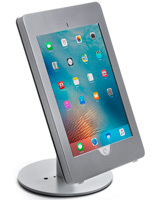 Prevent users from switching to other apps with a POS fixture that blocks access to the home button. 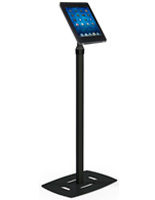 This is best for times when customers and patrons should be looking at an intended presentation without distractions. 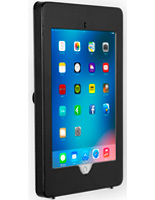 Alternatively, employees and managers benefit from stands with an open home button, allowing them to navigate to other apps without having to open the case. 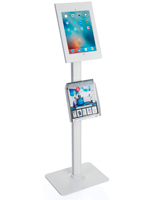 Touchscreen displays can also include a custom printed graphic panel on the front for increasing promotional space. 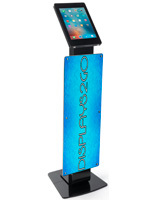 Feature a company logo or branding information imprinted in full color with a high quality digital process or get one without included printing to insert your own poster. 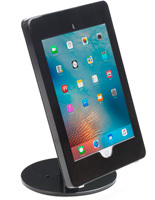 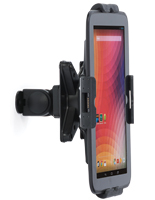 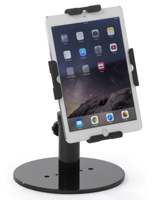 What features do these Apple® tablet holders share? 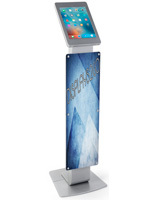 All of our kiosks feature a secure design to prevent theft and tampering. 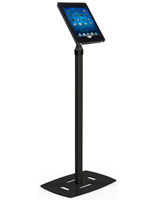 This makes them great for public areas, busy stores and trade show booths. Users don't need to worry about their valuable devices when they're held in a double locking metal enclosure. 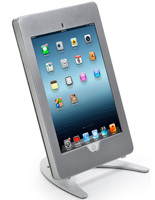 For durability in high traffic environments, each of the iPad kiosks shown here is made of strong aluminum or steel. 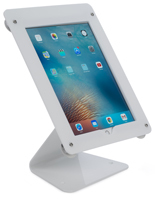 Our enclosures are made to protect electronics from damage. 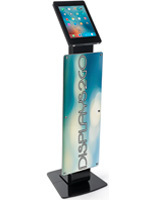 Our kiosks make excellent POS displays and presentation tools for any company. 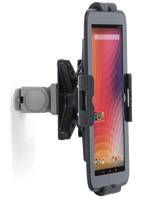 Our mounts benefit from quick shipping and wholesale pricing to outfit businesses quickly and affordably.